carpe factum: accomplishment integration management carpe factum: Ding Dong! The Witch Is Dead! 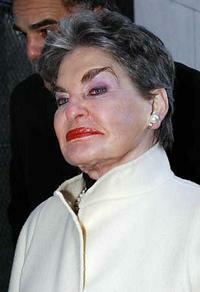 OK, so Leona Helmsley, the "Queen of Mean," is now going to be pushing up daisies... er... um... ok... maybe just weeds and occasional prickly thorn bushes. Many of you remember the stories that surfaced about her savage abuse of her employees during her years as a powerful hotel maven. The fact remains, though: she's dead. She can't yell at anyone, hit anyone, or abuse anyone from the grave. So it is with bullies. Dealing with them is a temporary state... or at least it should be. I'm always surprised by people who put up with bullies for years... or even decades. I learned about handling bullies early in my career. I worked for a couple of Leona Helmsleys in my day, and it wasn't fun. But eventually, I learned how to either fight back or move on. Fight or flight is a natural human response, but too often we throw up our hands in despair. Update your resume. Even if you have no intention of leaving at the moment, the mere act of doing this can be very empowering. It forces you to take inventory of your experience and the value you bring to an employer (albeit not your current one). You probably need a cheerleader at this point, even if it is yourself. Document the abuse. If possible, covertly record it (digital recorders are dirt cheap and can be hidden strategically). Put down dates, times, witnesses, what was said, the context, etc. Create a log of the abuse and maintain multiple copies of it at work and at home. After 1-2 months, consider visiting with an attorney. Then visit your HR department and show them the COPIES of your documentation (don't let them have the originals). HR departments are wising up to the fact that if you present them with evidence of abuse and they fail to act, they put the entire company at risk for a lawsuit. Take some sick days. Even if this will get you dinged on your next performance review, call a time out for your own sanity. Get away from the situation and take objective stock of what is going on. Daily abuse will only make matters worse. Enlist Others. Chances are good that you are not the only target of the bully. There is, after all, safety in numbers. The more of you that stand up to the bully, the better your chances of de-throning them. Each of these strategies is intended for the short-term solution only. A bully should never be allowed into your head... or worse yet, your heart. Taking some of the above steps should help insulate you and also empower you to take action. Michael - so great to hear from you! I read your post and it was a brilliant addition to my comments. And I love the picture of the kitten and the German Shepherds... a picture really is worth a thousand words.